After a couple of hours working on the toe (I’m slow, I know) on Sunday, I finally got to the lace pattern yesterday morning. During my break, I decided I’d get a start on the lace, completely terrified of what kind of mess I was about to create. Luckily, no mess occurred. That’s not to say I knit the pattern perfectly, though. I understood most of the lace language, but the skp slipped me up a bit. I absolutely panicked. Turns out it’s really not difficult. The source I found (if I can ever find it again, I’ll share) said to slip as if to knit, knit the next stitch, and then pass the slipped stitch over that knitted stitch. It’s essentially just a decrease. I worked very slowly on the first round. I think it took me 10 minutes to do 30 stitches, which is extraordinarily slow for me. I just wanted to make sure I got it right, and I’d always heard that lace was not a race. You don’t rush lace. A few rounds in and I’m in love. 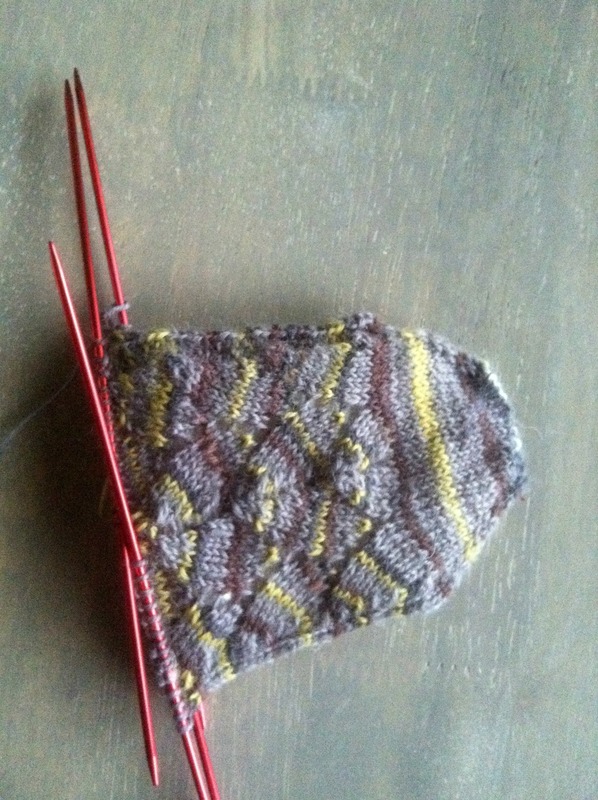 The whole process reminds me of Fair Isle in a way, which I previously had thought was my favorite type of knitting. It’s a slow process and I have to pay attention, but I have to just do another row to see how the pattern is going to turn out. It’s addicting! I’m still making mistakes here and there, but I haven’t lost a stitch yet. The biggest issue I’ve had is keeping tension. At first, I tended to knit the side parts of the pattern fairly loosely and the middle very tightly. The end result was, of course, this huge pucker in the middle of my sock. I thought about ripping it out and starting again, but this is a learning process. I’m expecting to mess up. Mistakes won’t mean I won’t use these socks. After all, you should see the thumbs on my Selbu mittens. They’re horrible and messy, but I wear those mittens with pride every time it’s cold just because they were my first mittens. As if I didn’t have enough knitting, I spoke with my mom and she’d like a shawl for her birthday, which is late March. I say that like it’s a horrible thing and I’m so busy, but I love having a lot of knitting going on at once. I won’t go into too many details just yet as things are set in stone, but I’m thinking about a heavy lace pattern (I found a pattern; I just need to swatch) in Knit Picks’ Comfy Worsted Yarn in Seraphim. Mom says it needs to be machine washable, which the Comfy Worsted Yarn says it is; other than that, she has no specifications. I’ll probably be ordering the yarn and new interchangeable needle in size 10 shortly, as I’m running out of time. Today is large project day. I’ll be sitting down to work on my husband’s sweater this evening and hopefully adding another couple of inches. It’s almost the length of my hand so far, but it needs to be about 14 inches before I get to the next part. At least it’s mindless, relaxing knitting, all stockinette. Thanks! I wasn’t entirely sure about the self-striping yarn, but I think it’s turning out just fine. Toes and heels take a bit of practice, and I’m way far from being an expert on either. I like your yoga socks, though! I haven’t tried knitting socks without the toes or heels. They look comfy!